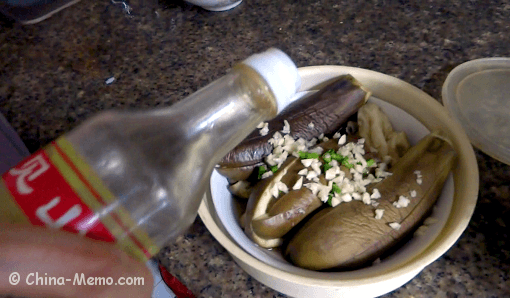 My parents usually like to make this spicy eggplant dish during the summer. 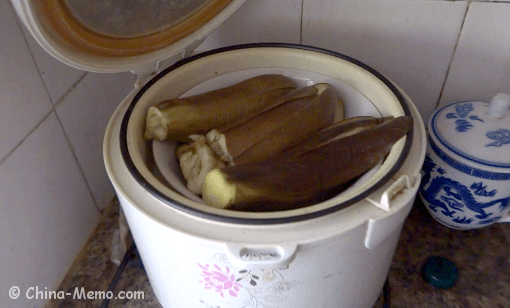 The eggplant is either cooked by pressure cooker or rice cooker. The pressure cooker takes less than 15 minutes. But because Chinese mainly eat a lot rice, cooking vegetable using the rice cooker seems to be a very convenient option. 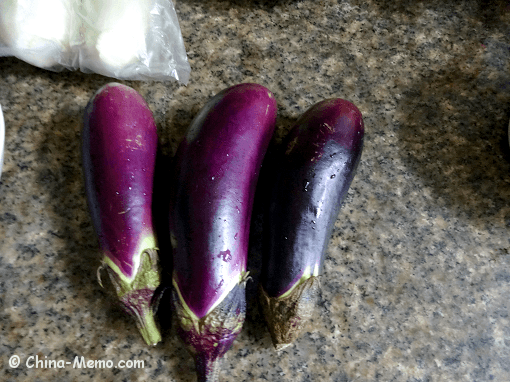 Cut the eggplant in lengthways. 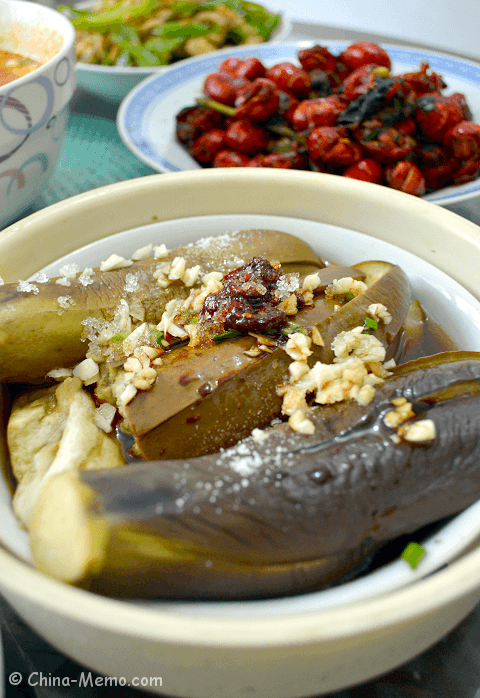 • Place the eggplant inside of rice cooker, on top of the rice. Depending on the type of rice cooker, my parents’ rice cooker includes a layer on the top which can be used to cook other food, but mine does not have this layer. If you don't have rice cooker, you may use the pressure cooker, or steamer, but adjust time accordingly. 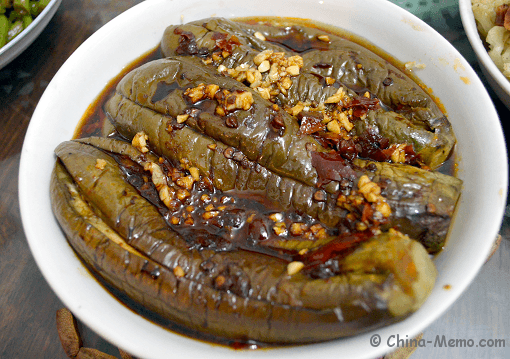 You can check my other recipe for Chinese steamed eggplant. • After about 20 minutes, rice is cooked. 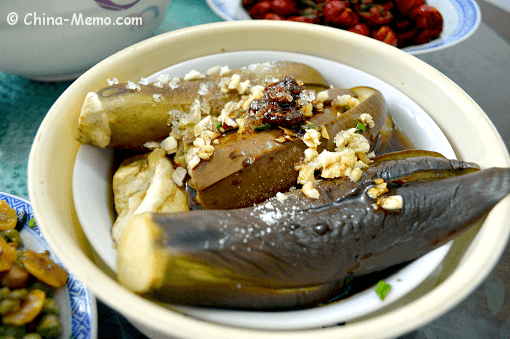 Take the eggplant out, add the smashed garlic, Chinese chilli bean paste, light soy sauce and sesame oil. • Garnished by spring onions. Serve immediately. 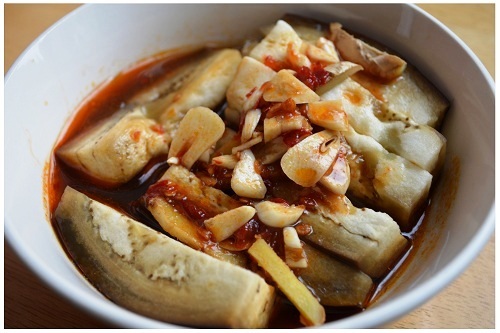 • To add more interesting flavour, you may also grind some roasted peanuts to add on the top. 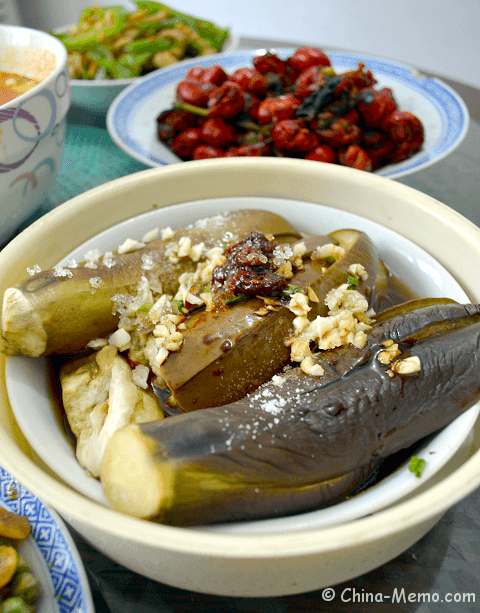 • For a better taste, the eggplant needs to be cooked till fully softened. So if you are using the steamer, it might need more time. 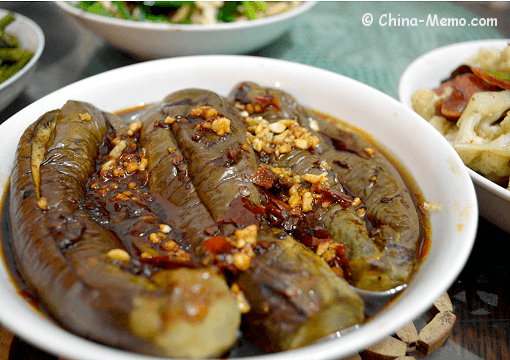 The eggplant is so soft that easy to break down and obsorb flavour. 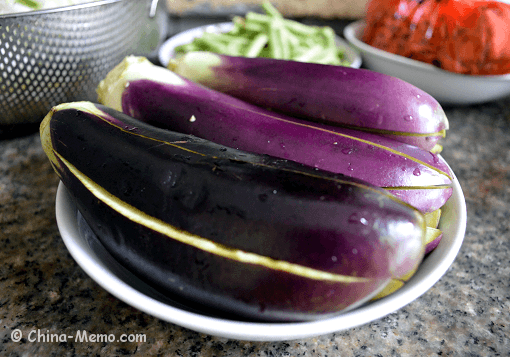 • You may aslo first mix all ingredients in a bowl, then pour on top of the eggplant. I find this might be a better way for mixing the taste. 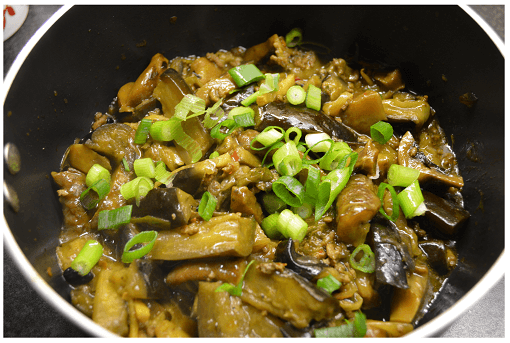 If you prefer your eggplant dish to have other flavour, you may check the recipe for Chinese red cooked eggplant with dry mushroom. 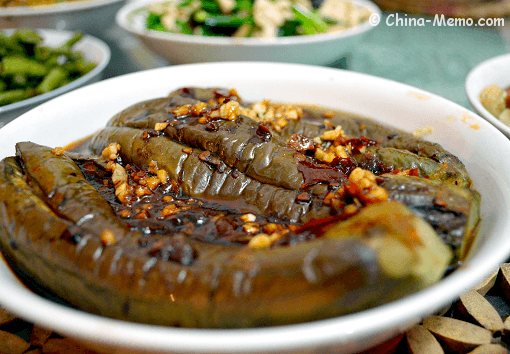 Hope you like this Chinese Spicy Eggplant dish. If so, please feel free to Like it on Facebook and share with your friends. 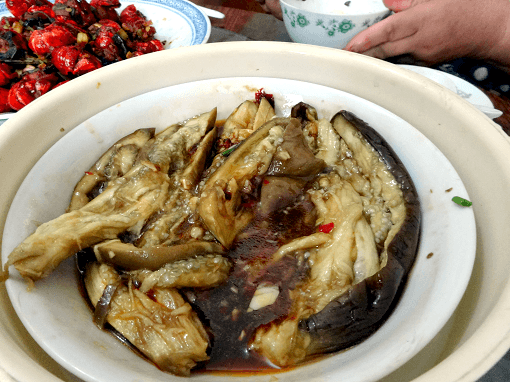 You may also like this Chinese red cooked eggplant with dry mushroom, recipes for steamed food and more Chinese Veggie Recipes from my site.